He provides some excellent outside perspectives on Roman history. Narratives are compelling, and he's educated and uniquely opinionated in ways I rarely see in a history podcast. When we talk about the fall of the Roman Empire, we're only talking about the western half - France, Spain, Italy, North Africa, and Britain. The eastern half of the Roman Empire survived the disastrous fifth century and would last in one form or another until 1453. What was so special about the eastern half of the Roman Empire, and how did it avoid the fate of its western cousin? How did Latin splinter into the Romance languages? In this episode, we explore how Latin transformed from a single, widely dispersed language into a series - French, Spanish, Portuguese, Italian, Romanian, and so on - of related but no longer mutually intelligible tongues. Cities were what made the Roman world Roman, but as the Empire fell apart, so did its cities. They shrank drastically or disappeared entirely between 400 and 600. In today's episode, we'll find out how and why. Cities were what made the Roman world, well, Roman. They were centers of culture and political life, and they were the bedrock that tied together its economy. Today we'll explore how those cities came into being, what sustained them, and what made them so important to the Roman Empire. History does not repeat itself, but it does rhyme, said Mark Twain. From the fall of the Roman Empire to the rise of the modern world: history ebbs and flows over the centuries, driven by great tides of economic, social, political, religious, and cultural change that shape the world and everyone who lives on it. In this new series from Wondery, PhD historian Patrick Wyman (Fall of Rome) brings the cutting edge of that history to listeners in plain, relatable English. Episodes 1 & 2 out now! 23: Could the Roman Empire Have Survived? Could the Roman Empire have survived past the fifth century? To answer that question, we examine some other points when the Empire could have fallen apart but didn't, and what brought it back together after Caesar's assassination and the Crisis of the Third Century. Take the survey at wondery.com/survey. Saint Augustine is one of the foundational figures of Christianity and one of the most influential thinkers of all time. He was also a complex and fascinating figure in his own right. Elizabeth Bruenig, an editor at the Washington Post and writer on politics and Christianity (@ebruenig on Twitter) joins me to discuss Augustine's life, thought, and greater meaning. Take the survey at Wondery.com/survey. As central government disappeared from what had been the Western Roman Empire, the barbarian kingdoms stepped into the void, creating new forms of rulership and institutions that would lay the groundwork for the fragmented, fractured medieval world. Take the survey at Wondery.com/survey. Roman Britain fell fast, and it fell hard. Into the ruins of this world stepped a wave of migrants from the North Sea coast of the Continent whom we know as the Anglo-Saxons. This migration, a complex and dynamic movement of people over the course of 200 years, rewrote the political, demographic, linguistic, and cultural maps of eastern Britain, transforming it into England. Watch a preview of Genius, the new show on National Geographic about Albert Einstein, starring academy award winner Geoffrey Rush: NatGeoTV.com/Genius Take the survey at wondery.com/survey. Why didn't Rome rise again? Everywhere else in the world, the appearance of one great empire was marked by their recurrent resurgence, but in Europe it happened only once. Professor Walter Scheidel of Stanford University - the author of numerous outstanding books on Rome and beyond, most recently "The Great Leveler", on the history of economic inequality - argues that this lack of recurring empires is what laid the groundwork for the eventual rise of Europe, the Great Divergence, that underpins the modern world of today. Watch a preview of Genius, the new show on National Geographic about Albert Einstein, starring academy award winner Geoffrey Rush: NatGeoTV.com/Genius Take the survey at wondery.com/survey. As the Roman Empire disintegrated, northern Gaul turned first into a military province and then into a playground for warlords, some Roman and some barbarian. This episode is the story of how one warlord and one group navigated this environment to become the kingdom of the Franks. Watch a preview of Genius, the new show on National Geographic about Albert Einstein, starring academy award winner Geoffrey Rush: NatGeoTV.com/Genius Take the survey at wondery.com/survey. 17: Ostrogothic Kingdom or the Western Empire Reborn? Under the leadership of their great king Theoderic, the Ostrogoths built a kingdom for themselves in Italy. But was this a kingdom, and Theoderic a king, or was he an emperor and his new realm the Western Empire reborn? Watch a preview of Genius, the new show on National Geographic about Albert Einstein, starring academy award winner Geoffrey Rush: NatGeoTV.com/Genius Take the survey at wondery.com/survey. The ashes of the Roman Empire produced a host of new states built on the foundations it left behind. The first of these was the Visigothic Kingdom of Toulouse, which dominated southern Gaul and helped bring about the end of the Roman Empire. Watch a preview of Genius, the new show on National Geographic about Albert Einstein, starring academy award winner Geoffrey Rush: NatGeoTV.com/Genius Take the survey at wondery.com/survey. Taxes, soldiers, and loyalty: these were the foundations, the structures, of the Roman political system. This episode explores how and why they fell apart over the course of the disastrous fifth century, which saw the provinces gradually slip away from the control of the imperial center. Watch a preview of Genius, the new show on National Geographic about Albert Einstein, starring academy award winner Geoffrey Rush: NatGeoTV.com/Genius Take the survey at wondery.com/survey. It took just 80 years for the Roman Empire to fall apart completely, from a ponderous but functional state at the death of Theodosius the Great 395 to nonexistence by 476. How and why did that happen? In this narrative, we examine the major figures and events of the calamitous fifth century. Take the survey at wondery.com/survey. The Roman world was more than just an empire; it was a cultural, social, economic, and political space built on the easy movement of goods, people, beliefs, and practices from place to place. It was a broad unity, and when the Roman Empire fell, so too did that easy movement and the world it had created. Take the survey at wondery.com/survey. The Roman economy was a marvel, the powerhouse that produced surpluses big enough to support huge cities, maintain an enormous standing army, and construct monumental buildings that stand to this day. When the Roman state fell apart, so too did the economy it supported, but in different ways, in different places, at different times. If you have a spare moment, take the survey at wondery.com/survey. The economy of the Roman Empire was surprisingly modern, featuring commercial markets, large-scale production, and agricultural sophistication that wouldn't be matched until the middle of the nineteenth century. In this episode, we explore how it was organized, how it functioned, and what it had come to look like just before it all went south. If you have a spare moment, please take the survey at Wondery.com/survey. Attila the Hun is the best-known barbarian from antiquity, but the Hunnic Empire he inherited and expanded hasn't gotten the credit it deserves for its complexity and organization. This episode explores how the Huns created an empire that stretched from the Ural Mountains in Russia to the Rhine River in Germany. North Africa was the most prosperous region of the western Roman Empire, the agricultural heartland that fed the city of Rome, and the barbarian Vandals' conquest of the region was the final nail in the coffin of the Western Empire as a whole. Gladiators are one of the defining characteristics of the Roman Empire in popular culture. How and why did they disappear? We explore the topic in this special episode. Gaul was one of the heartlands of the Roman Empire, and it encompassed a tremendous amount of diversity within its borders. Over the course of the fifth century, the region split along its fault lines, with three different paths emerging for its constituent parts. The north became a playground for Frankish warlords, while in the two southern locales, life went on much as it had before. In 350, Britain was a thoroughly integrated province of the Roman Empire, full of prosperous, Latin-speaking cities, luxurious villas, and all the other trappings of Roman life. By 500, the cities were gone, the economy had collapsed, and the island was split among an innumerable number of petty kingdoms. What happened? How did everything go so wrong? 5: Just How Screwed Up Was the Later Roman Empire? One of the fundamental questions about the later Roman Empire is just what a mess it really was. Did the barbarians topple a fundamentally healthy, functional state? Or were they merely the straw that broke the camel's back of a diseased, rotten, empire that could no longer hold itself together? In this episode, we discuss just how things had changed between the peak of the Roman Empire in the second century and the beginning of the end in the fourth. In 395, the barbarian Goths rebelled against the Romans and fought a campaign that culminated in the sack of Rome in 410. But were the Goths really barbarous foreigners, or are they better understood as a Roman army seeking a position within the Empire? 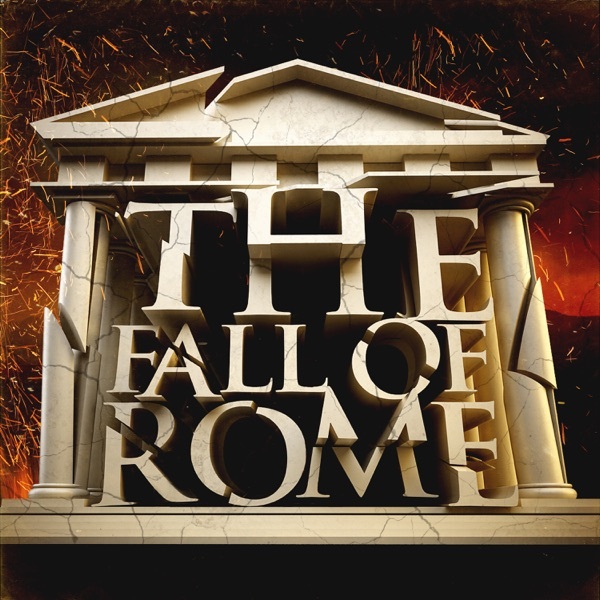 In the third episode of The Fall of Rome, we explore the Goths' migration into the Roman Empire and their desperate war for survival against the forces of the Empire. This conflict culminated in the Battle of Adrianople, the worst defeat of a Roman army in more than 350 years. How did a rag-tag group of migrants defeat the cream of the army and leave an emperor dead on the battlefield? We explore the barbarian world beyond the frontiers, focusing on the fearsome Goths who would one day leave an emperor dead on the battlefield, sack Rome itself, and found a kingdom of their own inside the empire's borders. The barbarian world was tightly tied to Rome, and those connections are what we'll investigate today, through the eyes of a Goth named Wulfila. Take the survey at Wondery.com/survey. Barbarians, political breakdown, economic collapse, mass migration, pillaging and plunder. In the introduction to this series, PhD historian Patrick Wyman takes you through the broad outlines of the fall of the Roman Empire, one of the most important events in history.